Doors, door blocks, are produced for housing, public, production and auxiliary buildings and designs from wood of coniferous and sheet breeds. 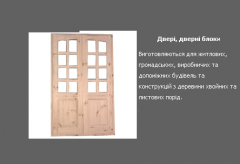 Unbelievable price on Interior doors in Ivanchi (Ukraine) company Predpriyatie gosudarstvennoj kriminalno-ispolnitelnoj sluzhby Ukrainy (№76), GP. Wide choice of quality products at affordable prices.